The US Youth Soccer National League competition is for the nation's top teams in the Under-14, Under-15, Under-16, Under-17 and Under-18 boys and girls age groups, consisting of a total of 16 teams per gender age group. The National League offers additional exposure to collegiate, professional and U.S. National Team coaches and offers the highest level of competition in the country as each team must earn their place in the league. 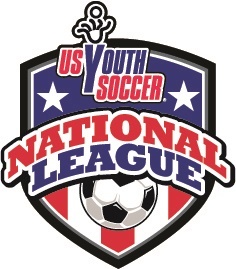 National League teams continue play in their respective US Youth Soccer Regional Leagues and State Championships to complete their competitive calendar. Teams play a seven-game schedule over two weekends, facing each team within its age group division one time. The League consists of three weekends of play per gender, with each team playing two of the three weekends. The top two teams from each division (Blue and Red) advance to the US Youth Soccer National Championships, the oldest and most prestigious youth soccer national championship in the country. The four National League representatives will join the four Regional Champions in the U-14 through U-18 age groups to play for the National Championship. The top two teams from each age group division also secure a spot to return to National League play the following season.